....and while I'm at it, and since I'm now back to my own blessed computer and English-language keyboard, I have to warn you not to be surprised if you see the letters "caf" randomly stuck in the middle of my words, occasionally. That's because in order to type the "é", which is often used in French, I have discovered that the fastest way is to type the word café -- the only word in which the accent pops up automatically and try to remember to erase the "caf". For the rest of the letters and accents, I can hit the insert button, or I can cheat and google words that have the accents and then cut and paste. I must admit that I do not buy a whole U Lente Brebis Corse. They have one open with samples cut up at the store, and -- well -- let's just say that's enough for me. It's a fairly strong, herbaceous, and fragrant (aka stinky), semi-soft cheese from Corsica, made from raw sheep's milk. U Bevinco is a family farm and cheesemaker in its third and fourth generation, currently run by Laurent Dolcerocca and his daughter Joelle. 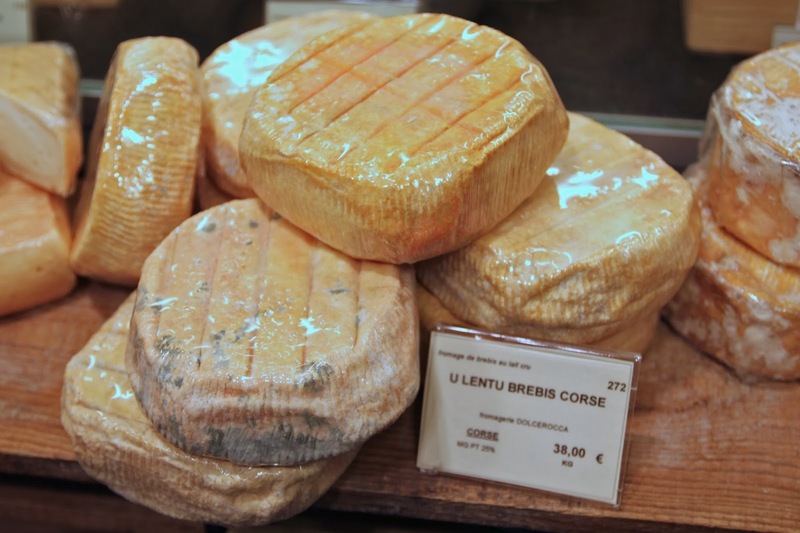 Besides the U Lentu, or the Lentu as it is sometimes called, is made alongside three sister cheeses Bevincu, Saint-Roch et Grognard. It looks like I've typed it on some foreign keyboard: U Lentu. It sure doesn't look like French. Ironically, if I typed my usual way but on a French keyboard, it would actually come out looking just like it's supposed to: U Lentu. All of which reminds me of when I was just about to get married and Anthony and I were getting our license, at the last minute, across the country from San Francisco where the ceremony was going to be held outside of Boston. We went to the county clerk who typed up our info, then sent us to another building to file our document, with about 15 minutes to spare before the wedding weekend. When we got to the other building, there was a sign there that said "All information must be typed correctly," and of course just as I read those words, she asked to verify our spelling and she said to my fiancé, "Is your name really Abhibit H...?" Evidently, the woman who had typed in the info had her fingers placed one space over. The clerk said we would have to go back to the first building and get it done correctly, then return, and by now we had very little time indeed. Stunned, and suddenly panicked, we asked her, "Could we just change his name to Abhibit? Would that be faster?!" But no, that would require forms filled out in the other building, too. So we sprinted back and forth, and just barely by the skin of our teeth made it to get our marriage license.